Oscar winning actress Elizabeth Taylor died today at Los Angeles' Cedars-Sinai Hospital. She was 79. "She was surrounded by her children: Michael [Howard] Wilding, Christopher Wilding, Liza Todd, and Maria Burton," Taylor's publicist, Sally Morrison, said in a statement. "My Mother was an extraordinary woman who lived life to the fullest, with great passion, humor, and love," he said. "Though her loss is devastating to those of us who held her so close and so dear, we will always be inspired by her enduring contribution to our world. Her remarkable body of work in film, her ongoing success as a businesswoman, and her brave and relentless advocacy in the fight against HIV/AIDS, all make us all incredibly proud of what she accomplished. We know, quite simply, that the world is a better place for Mom having lived in it. Her legacy will never fade, her spirit will always be with us, and her love will live forever in our hearts." In addition to her children, Taylor is survived by 10 grandchildren and four great grandchildren. Morrison said that a private family funeral will be held later this week. In lieu of flowers, the family asked that contributions be made to the Elizabeth Taylor AIDS Foundation and said that those wanting to send personal messages can log on to Taylor's official Facebook page. Click here to see photos of Elizabeth Taylor through the years. Taylor, a two-time Academy Award-winning actress who became notorious for her seven marriages and sometimes eccentric behavior, had reported health problems in recent years and appeared frail in public appearances. Six weeks ago, she was hospitalized with congestive heart failure. Though she had recently suffered a number of complications, her condition had stabilized and it was hoped that she would be able to return home. Elizabeth Taylor posing on the beach. In October 2009, Taylor said she was having a heart procedure done. Via Twitter, she said it was "very new and involves repairing my leaky valve using a clip device, without open heart surgery so that my heart will function better." The actress' past health setbacks included a fall from a horse during one of her early film shoots, bouts with pneumonia and skin cancer, a tracheotomy, treatment for alcohol and painkiller addictions, and lung, hip, brain and heart surgeries. She had anywhere from 30 to 40 surgeries, according to biographers. Elizabeth Taylor posing in a red bathing suit, 1953. But she's iconic for being one of the most popular actresses of Hollywood's golden age. Taylor was born in London in 1932 to American parents who returned to the U.S. with World War II looming. She bounded into the spotlight at age 12 after starring in the 1944 box office sensation "National Velvet." She won acclaim as an adult with 1951's "A Place In The Sun" and went on to score best actress Oscar nominations for "Raintree County," "Cat on a Hot Tin Roof," and "Suddenly, Last Summer." In 1963, she memorably starred in "Cleopatra." She later won Oscars for "Who's Afraid of Virginia Woolf?" and "Butterfield 8." Beyond acting, Taylor is credited with bringing the world's attention to AIDS with her fund-raising and activism. In 1985, when Taylor's lifelong friend Rock Hudson died of AIDS, she brought national attention to the growing disease. She raised and donated millions of dollars to the cause, founding the American Foundation for AIDS Research (amfAR) and The Elizabeth Taylor AIDS Foundation. She cultivated friendships with men who stayed away from the public's gaze and met a tragic end. In addition to Hudson, she kept actor Montgomery Clift as a confidant and was fiercely loyal to pop icon Michael Jackson when he was accused of child molestation. Taylor served as a godmother to two of Jackson's children, Paris Jackson and Prince Michael. She was also an entrepreneur, spearheading a successful line of perfume and multiple jewelry lines. In 1999, Taylor was appointed Dame Commander of the Order of the British Empire. Elizabeth Taylor and Michael Jackson at the 1993 American Music Awards. In a 1999 interview with ABC News' Barbara Walters, Taylor revealed how she ultimately wanted to be remembered. Asked what she'd like to have written on her tombstone, Taylor replied, "'Here lies Liz. She lived,'" before admitting, "No, I don't like 'Liz.' I hate that name. 'Here lies Elizabeth. She hated being called Liz. But she lived.'" 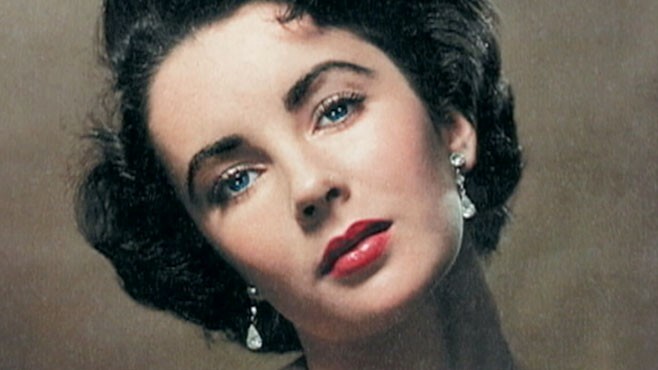 Click here for a video montage of Elizabeth Taylor's interviews.